The CD33 antigen is a 67 kDa single-chain transmembrane glycoprotein reported to be a sialic acid dependent adhesion molecule. The extracellular portion of the molecule belongs to the Ig superfamily, involving one V-like and one C2-like domains. This antigen shows some homologies to myelin-associated glycoprotein and to the CD22 molecule. 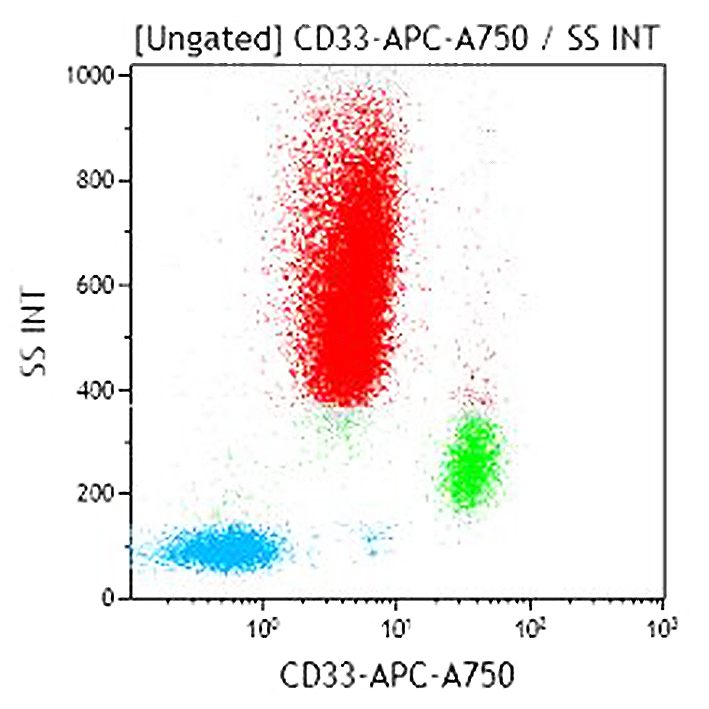 CD33 antigen is expressed on monocytes in peripheral blood. In the bone marrow, it is found on granulocyte and macrophage precursors, and is absent from pluripotent stem cells. *Alexa Fluor and Pacific Blue are registered trademarks of Molecular Probes, Inc.